[prMac.com] Vilnius, Lithuania - Jumsoft, developer of high-quality applications for OS X and iOS, today is thrilled to announce an update to its template assortment for Apple's iBooks Author. The newly released Book Palette v1.3 contains 35 stylish and versatile templates, 10 of which are brand new. Book Palette provides templates for various e-book styles - from fiction and business consulting to cookbooks and photo albums. The new additions include a number of albums and colorful all-purpose designs for various publications. "This time, we have prepared a bright, fun, and very modern update," said Algirdas Unguvaitis, general manager of Jumsoft. "All the newly added templates have been inspired by the latest trends in graphic design to give a decidedly fresh look to your self-published books." All 35 templates incorporate the full set of standard section and page layouts provided in the iBooks Author app, including covers, chapter pages, text pages, tables of contents, glossary pages, and more. A wide selection of text styles for different book elements ensures a vivid yet consistent look in each template. Most elements in Book Palette can be easily recolored, moved, or removed. Users can type or paste in their own text, add and remove text boxes, and change the fonts. Stock images can be replaced with users' own photos or pictures. Gallery, video, and other widgets featured in iBooks Author also have a matching look in Book Palette, and the app allows users to adapt these elements to their own requirements. 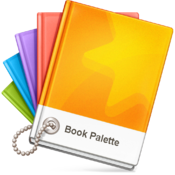 Book Palette 1.3 is $9.99 USD (or equivalent amount in other currencies) and available worldwide through the Mac App Store in the Graphics & Design category. After the app is downloaded, it will be automatically installed on a user's Mac. Based in scenic Vilnius, Lithuania, Jumsoft is a privately funded company founded in 2002. Committed to providing the highest quality software, Jumsoft is a dedicated group of Apple Macintosh experts whose goal is creating and marketing exciting, easy-to-use and powerful applications for the Mac Platform. Jumsoft most recently focused its attention on maximizing the potential of Apple's iWork, quickly becoming the leading provider of Keynote themes and objects. Copyright 2002-2014 Jumsoft. All Rights Reserved. Apple, the Apple logo, are registered trademarks of Apple Computer in the U.S. and/or other countries.